Construction crews are busy during the spring and summer. Come autumn, however, demand for their services starts to slow down. This means better contractors are more available, and they often offer lower “off-season” pricing. Spring and summer weather is unpredictable, bouncing between sweltering and stormy in a matter of minutes. The more consistent fall weather, on the other hand, dries out the terrain, making it easier to build without causing excessive damage. Summer construction is also more likely to ruin your plants while they’re in full bloom, whereas most flowers have passed their peak come autumn. On the topic of weather, fall weather is easier to account for. You’re less likely to encounter surprise thunderstorms, resulting in fewer delays. Also, cooler temperatures make for a less tiring work environment. If you’re a do-it-yourself-er, that means more energy and fewer breaks. People enjoy their decks most during the spring and summer, but if you wait until then to build your deck, you’ve already lost half the time. By getting your project done in the fall, you make the most of next year’s season. What If You Already Have a Deck? Even if you aren’t looking to start a new construction project, autumn is still a great time to perform some maintenance. 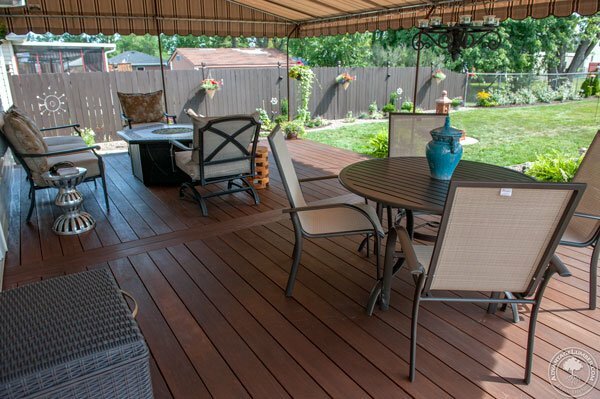 With all the summer parties behind you, you can focus on preparing your deck for winter. Start by clearing away plants and furniture. Be careful not to drag items across the deck, as this can cause splintering or scratching. Check for any deterioration such as rot or corroded screws, and replace parts that pose a hazard. Clean up any mildew or dirt buildup and give your deck a full sweep. Specialty deck cleaning products exist if you need a deeper scrub; just be sure to follow all manufacturer’s instructions. Continue sweeping throughout the fall season to prevent leaves from accumulating. Building a deck in the fall can save you time and money, as well as position you to make the most of next summer. So don’t put off that project just because the temperature is dropping; take advantage of the best time to create your outdoor space! It’s great to know about building a deck this year. We want to build a wood one this year, so we’ll be sure to look during the fall. Getting an “off-season” price sounds like a great idea! We really want to build a deck soon. With summer coming up, we thought that that would be the best time to build one, but maybe fall is better. I like the fact that it will go up faster in the fall!